Beatles FAQ: How did The Beatles get their name? How did The Beatles get their name? Dusty Springfield: John, this is a question which you've probably been asked a thousand times before, but you always..., all of you give different versions, different answers, so you are going to tell me now. How did the Beatles get their name? John Lennon: I just thought of it. DS: You just thought of it...? Another brilliant Beatle! DS: Were they called anything else before? John: Called, the uh, Quarry Men. 'I just thought of it' was in fact another of the 'different answers' Dusty Springfield alludes to. The dispute as to how The Beatles go their name has never been definitively resolved. By 1960 the name problem was becoming more pressing. According to John Lennon's first wife, Cynthia, there was then a drunken 'brainstorming session' in a Liverpoool pub at which Stuart Sutcliffe as came up with the name as a jokey tribute to to Buddy Holly and the Crickets. Why 'Beatles' and not Beetles? Cynthia's recollection does confirm that John 'thought up' reversing French term les beat to create a new word. Beatles rather than the orthodox beetle. 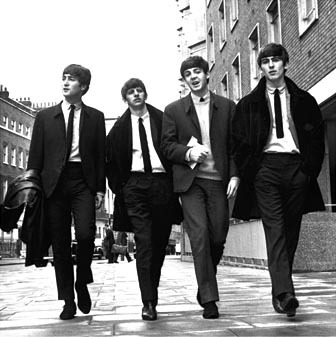 But for several months there were constant modifications of the new name - the group presented themselves as the Beatals, the Silver Beetles, the Silver Beats, and the Silver Beatles. Finally, in August 1960 they settled on the name and the spelling the world would know them by. The Beatles publicist, Derek Taylor, offered a different explanation In his memoir he suggested that the Marlon Brando film 'The Wild One' (1953) directly inspired the name. 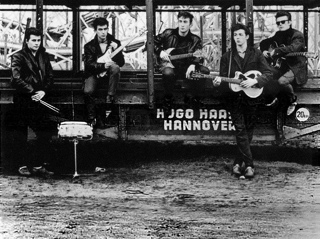 In 'The Wild One' there is scene in which Marlon Brando talks to his gang of 'young beetles' in a way that mirrors Lennon's relationship with the other band members. 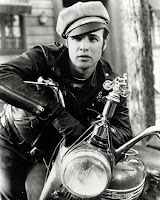 And the Brando look (leather jacket, cap, scowl) is the certainly image The Beatles projected around this time. The problem with this theory is that the The Wild One was banned in the Britain until 1967. Lennon was aware of the film but he could could not have seen it. Or perhaps he travelled into the future and watched it on Youtube?